Glenn and I traveled to the island of Sicily last May via Paris and Rome, a journey that took 18 hours. After such a long trip it was a delight to be greeted at the Palermo airport by our traveling consort Edward and escorted to our villa outside of the city. Sicily is much larger than we were expecting and the landscapes and lifestyles are quite different from one side of the island to the other. There are two main cities on the island. To say that our travels took us from Palermo to Catania is like saying an Italian feast takes you from wine to coffee – the wine is bold and the coffee strong, but we always enjoy the antipasti, the paninis, the grilled tuna and the cannolis (oh the cannolis!) in-between. 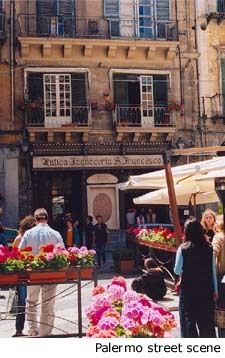 Sicily is the largest and one of the most diverse islands in the Mediterranean. Rolling hills, rugged wilderness and dense forests cover the interior while the coast is coated with golden beaches. Snow-capped Mount Etna, Europe’s largest active volcano, towers over it all. Three seas wash the shores of this triangle in the Med and the people hail historically from all corners of Europe, and from Asia and Africa. This diversity of geography, history and culture is reflected not only in the Sicilian lifestyle but also in the island's architecture and cuisine. 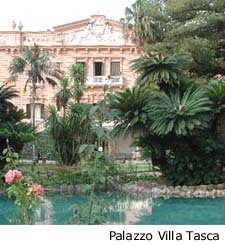 We spent the first night in the elegant, 18th century Palazzo Villa Tasca, a mansion near the historic center of Palermo. The villa’s long, stately driveway leads you from the mayhem of the city to a private, quiet oasis. We were greeted by a full compliment of suitably attired staff, including a butler in white gloves who offered us chilled Prosecco from a silver tray. The villa is adorned with a seemingly endless number of large, open rooms and the ceilings in several of the suites are covered with intriguing18th century Frescos. The home is surrounded by almost three acres of parkland and a romantic pathway connects the house to a charming pond with swans and a nearby gazebo. 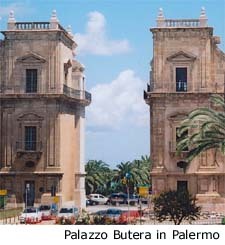 Like several properties owned by Sicilian nobility, the property has been in the same family since the 14th century. We were joined by the principessa the first morning for breakfast on a sun-filled terrace. We were lucky to have a Sicilian host during our time on the island and we found the Sicilians to be very strong, proud people. Like the olive oil and wines produced around the island, the Sicilian character is delightfully distinctive. Driving in Palermo can be very intimidating for those not accustomed to chaos and Edward (thankfully) became our driver as we explored the island for several days. Stop signs and stoplights are considered optional and we had to hold our breath to pass through the narrow streets. In the smaller towns we drove down streets so narrow that people had to step into doorways to allow us to pass. Our first day we drove west from Palermo to Mondello, a beach resort with tree-lined residential streets not far from Palermo’s city center. 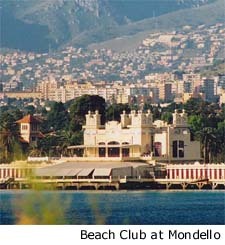 Originally a picturesque fishing village, Mondello is now a favorite escape for Sicilians who come for the beaches and stay for the seaside restaurants. While in Mondello we had a chance to visit Villa La Palme, a comfortable family villa one mile from the beach in a residential neighborhood with beautiful gardens and a pool. Although the cafes in Mondello tempted us, we returned to Palermo to have lunch at La Mensa Del Popolo, a restaurant recommended by our Sicilian hosts. If you must diet, a word of warning: Don’t plan to do so in Sicily! Although not necessarily Atkins-friendly, the typical Sicilian meal is healthy and tasty. Fresh fruit from the around the island and fresh fish from the surrounding seas constitute large parts of a typical meal. Many Sicilians start their day with a croissant and an espresso or cappuccino and on the hot days it’s not unusual to find the croissant stuffed with ice cream and the coffee served over ice. We developed a taste for Palermo’s chickpea fritters called pane e panelle and the panini sandwich rolls served as a mid-day snack. The day’s main meal usually starts with an antipasti – vegetables in olive oil, seafood and fish salads or a soup with mussels, clams, cuttlefish or squid, and is followed by pasta. The main course often features seafood - tuna, swordfish or even sea urchins. Cannolis, cassatas and the superlative Sicilian ice cream are popular for dessert. We began our meal at La Mensa Del Popolo with seafood antipasti of calamari, octopus and shrimp in olive oil, followed by a salmon risotto and sea urchin pasta. We regretted we had little room left for dessert but enjoyed the strong, black coffee.